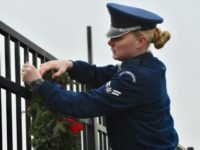 Over 1.5 million wreaths will be placed at veterans’ resting sites this weekend across 1,400 cemeteries by Wreaths Across America, a charitable organization founded by Karen Worcester. 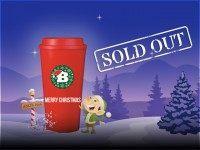 The executive director of Wreaths Across America, Karen Worcester, told Breitbart News Daily Sirius XM host Matt Boyle on Tuesday, “The cutoff for Arlington is December 14. 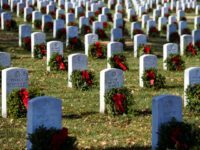 We’re just a few thousand short” to cover every headstone at Arlington National Cemetery with a fresh evergreen wreath on December 17, which is National Wreaths Across America Day. 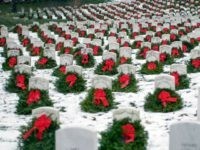 The executive director of Wreaths Across America, Karen Worcester, joined Breitbart News Daily SiriusXM host Alex Marlow on Monday to discuss National Wreaths Across America Day, which is December 17, and to explain how people may get involved to help the deeply patriotic organization. 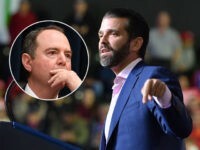 She also thanked Breitbart News readers and listeners for being “instrumental” in helping the group meet its goal of placing a wreath on every headstone at Arlington National Cemetery last year. 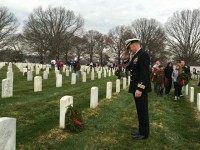 ARLINGTON, VA — Rep. Ryan Zinke (R-MT), retired commander at the fabled Navy SEAL Team Six and an Iraq War veteran, was among the thousands of volunteers at the Arlington National Cemetery placing commemorative garlands on veteran headstones for Wreaths Across America Day. 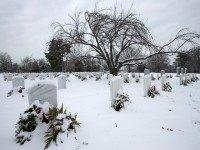 None of the headstones at the Arlington National Cemetery will have to forego wreaths this holiday season thanks, in large part, to the Breitbart News Daily audience. 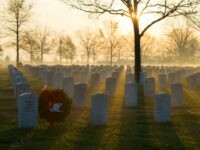 Wreaths Across America, a non-profit responsible for placing commemorative garlands at the 230,000 headstones in Arlington National Cemetery, was able to reduce its wreaths deficit by more than half in one day, to 7,500, thanks in part to donations from Breitbart News Daily listeners. 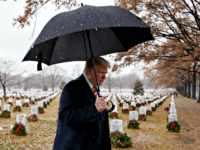 Wreaths Across America, the non-profit that has set a goal of placing a remembrance wreath at each of the nearly 230,000 headstones at Arlington Nation Cemetery, is still facing a shortfall this holiday season of about 18,000 commemorative garlands. 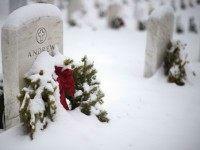 Wreaths Across America, a non-profit group that for the last 23 years has been placing wreaths on the graves of our nation’s fallen warriors without any government assistance, is thousands short of its goal of placing one commemorative garland at each of the nearly 230,000 headstones at the Arlington National Cemetery, due to a lack of funding this holiday season.